Nearing the end phase of their intended usage. The various reasons for which the electrical and electronic equipment discarded are given as a graphical representation in [Figure 1]. The e-waste has been identified as hazardous waste by the Basel Convention and developed a framework for control on transboundary movement of such waste. The massive generation of e-waste on one side accompanied with the lack of stringent legal policies and environmental regulations for managing the hazardous e-waste has resulted in the formation of number of informal sectors. These unorganized sectors continue to use rudimentary processes and practices such as open burning, acid baths and heating of circuit boards, resulting in emissions and release of toxic elements into the environment. These clusters have been operational for many years and have been handling extensively large volumes of e-waste without any personal protective equipment's and not using proper pollution-control devices or measures to capture the pollutants being released into land and water sources in and around the area. The spent acid with residual metals is discharged into open land and finally absorbed by soil and surface water. Even though the damage caused by informal e-waste recycling activities in India is immense, there is no specific law in places that regulates the e-waste and thus poses a serious occupational health risk. This study attempts to reveal the various occupational health hazards related to the informal recycling of e-waste and takes a special interest in creating the public awareness especially for children who are actively involved in e-waste processing. The composition of e-waste differs from product to product. Broadly it consist of diverse of materials which includes ferrous and nonferrous, metals, plastics, glass, wood and plywood, printed circuit board, rubber, ceramics and other items. Iron and steel constitutes 50% of the e-waste, plastics 21%, nonferrous metals 13%, and the rest other constituents. Nonferrous metals consist of metals such as copper, aluminum and precious metals such as gold, silver, platinum, palladium, etc. The presence of elements such as lead, mercury, arsenic, cadmium, selenium, hexavalent chromium and flame retardants beyond the threshold limit in e-waste classifies them as hazardous waste. It is reported that in India about 800,000 MT of e-waste is generated annually. It is been estimated that e-waste generation in India is expected to exceed 1,200,000 tons by 2015. 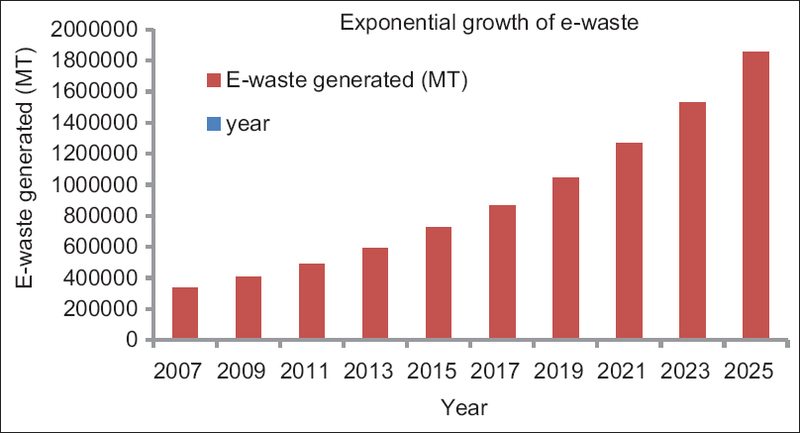 The Exponential growth of e-waste in India is shown in [Figure 2]. There are only two sectors which carry out e-waste recycling process formally in India. These facilities are M/s. Trishiraya recycling facility, Chennai and M/s. E-Parisara, Bengaluru. There is no large-scale organized e-waste recycling facility in India, and thus the recycling exists in un-organized sector. The maximum e-waste treatment is being carried out in an unregulated environment, where there is no control on emission of toxic material. Over 95% of the e-waste is treated and processed in the majority of urban slums of the country, where untrained workers carry out the dangerous procedures without personal protective equipment, which are detrimental not only to their health but also to the environment. Illegal imports of used EE products or WEEE from overseas has been added to the volume of e-waste being treated in India. In the growing economics, e-waste which is flowing from the wastes imports not only offers a business opportunity, but also satisfies the demand for cheap second-hand electrical and electronic equipment. An entire new economic sector is evolving around trading, repairing and recovering materials from redundant electronic devices. Though it is a source of livelihood for the urban and rural poor, it often causes severe risks to humans and the local environment. It is imperative that developing countries and India in particular wake up to the monopoly of the developed countries and set up appropriate management measures to prevent the occupational health hazards and mishaps due to mismanagement of e-wastes. A UN report estimates that the worldwide generation of e-waste is around 30-50 million ton/annum. Nearly 50-80% of e-wastes collected are exported for recycling by us. Since the export is legal in us. The export is due to cheaper labor and laxed standards in developing countries. E-waste recycling and disposal in China, India and Pakistan are highly polluting due to the release of toxic chemicals. The lack of responsibility on the part of federal government and electronics industry, consumers, recyclers and local governments toward viable and sustainable options for disposal of e-wastes. This has paved the way for the emergence of unorganized sectors for the informal recycling of e-waste. Since the e-waste is blend of plastics and chemicals, improper handling of e-waste is harmful to the environment as well as mankind. For the recycling of e-waste, India heavily depends on the unorganized sector as only a handful of an organized e-waste recycling facilities are available. Over 95% of the e-waste is treated and processed in the majority of urban slums of the country, where untrained workers carry out the dangerous procedures without personal protective equipment, which are detrimental not only to their health but also to the environment. In developing countries, the e-waste is dismantled manually and releasing the nondegradable plastics and persistent chemical to the environment thereby contaminating the quality of air, water and soil. 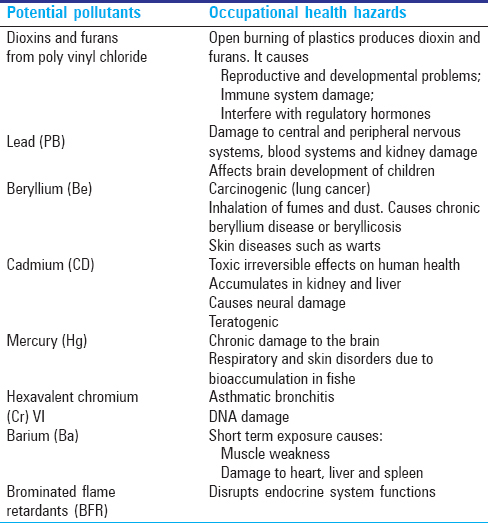 These illegal methods to recover the precious metals expose the workers to harmful chemicals such as heavy metals, inorganic acid, polycyclic aromatic hydrocarbons, etc., which are potential pollutants and cause serious occupational health hazards that are listed in [Table 1]. 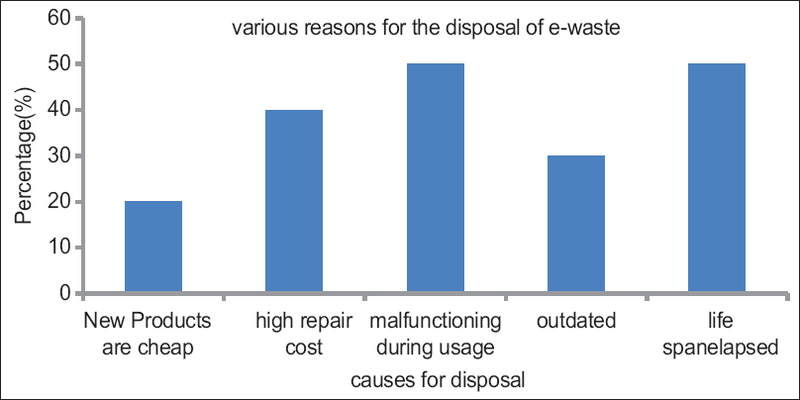 [Figure 3] represents informal processing of e-waste. Cadmium can be found in plastics, cadmium plated steel, solders, and TV picture tubes. ,, Cadmium toxicity can lead to kidney, bone, and pulmonary damage. There are three modes of exposure: Dermal, pulmonary (lungs), and gastrointestinal (mouth). An estimated 22% of the mercury used worldwide each year goes into electrical and electronic equipment including batteries, flat-panel display screens, and switches. Even very small levels of mercury exposure are known to cause damage to the brain, spinal cord, kidneys, liver and even for a developing fetus. Polybrominated diphenyl ethers (PBDEs) are synthetic chemical compounds that are used as flame retardants (chemicals that are added to polymers to prevent fires) in electrical and electronic equipment which are present in high-tech electronics such as TVs, computers or cell phones. Exposure to PBDEs has proven increased cancer incidence and altered thyroid function. Thus landfilling does not appear to be an environmentally sound treatment method for substances, which are volatile and not biologically degradable (Cd, Hg, CFC), persistent (polychlorinated biphenyls [PCB]) with unknown behavior in a landfill site (brominated flame retardants). As a consequence of the complex material mixture in e-waste, it is not possible to exclude environmental (long-term) risks even in secured landfilling. It is a controlled and complete combustion process, in which the waste material is burned in specially designed incinerators at a high temperature (900-1000°C). Advantage of incineration of e-waste is the reduction of waste volume and the utilization of the energy content of combustible materials. Disadvantage of incineration is the emission to air from substances escaping flue gas and the large amount of residues from gas cleaning and combustion process. E-waste incineration plants contribute significantly to the annual emissions of cadmium and mercury. In addition, heavy metals are not emitted into the atmosphere and are transferred into slag and exhaust gas residues which can reenter the environment on disposal. Therefore, e-waste incineration will increase these emissions if no reduction measures like removal of heavy metals are taken. Recycling options for managing plastics from end-of-life electronics are of three types. Any recycling process involves dismantling, that is, removal of different parts of e-waste containing dangerous substances such as PCB, Hg, separation of plastic, removal of cathode ray tube (CRT), segregation of ferrous and nonferrous metals and printed circuit boards. Recyclers use strong acids to remove precious metals such as copper, lead, gold. The value of recycling from the element could be much higher if appropriate technologies are used. The recyclers are working in poorly-ventilated enclosed areas without mask and technical expertise results in exposure to dangerous and slow poisoning chemicals. Mercury impacts brain functioning and development. Therefore, recycling is the best possible option for the management of e-waste. It constitutes direct second-hand use or use after slight modifications to the original functioning equipment. It is commonly used for electronic equipment such as computers, cell phones, etc. Inkjet cartridge is also used after refilling. This method also reduces the volume of e-waste generation. It is the responsibility of the government to turn away more e-waste flowing from informal to formal sectors and to achieve positive utilization of informal collection networks for collecting e-waste from households thereby developing efficient incentive system for poor collectors and recyclers. Technical improvements of informal recycling processes coupled with proper training in handling WEEE has to be offered to the local industry and community so to obtain better environmental performance without sacrificing the economic and social benefits. This will provide a remedy for the occupational health hazards related to the informal recycling of e-waste. Developing a better understanding of informal recycling and implementing more supportive policies for the informal sector that could result in hundreds of job opportunities for low-skilled workers in a complete safe environment is a sustainable solution for the current issue. Educating the children who are actively involved in e-waste processing in their own line creates e-experts for future generation and can handle this hazardous waste and turn in to the valuable resource. Schneider F, Enste DH. The Shadow Economy: An International Survey. Cambridge, UK: Cambridge University Press; 2003. Puckett J, Byster L, Westervelt S, Gutierrez R, Davis S, Hussain A, et al. Exporting harm: The high-tech trashing of Asia. The Basel Action Network (BAN); 2002. Silion Valley Toxics Coalition (SVTC) with Toxics Link India, SCOPE Pakistan and Greenpeace China; 25 February, 2002. Wong MH, Wu SC, Deng WJ, Yu XZ, Luo Q, Leung AO, et al. Export of toxic chemicals-A review of the case of uncontrolled electronic-waste recycling. Environ Pollut 2007;149:131-40. Huo X, Peng L, Xu X, Zheng L, Qiu B, Qi Z, et al. Elevated blood lead levels of children in Guiyu, an electronic waste recycling town in China. Environ Health Perspect 2007;115:1113-7. Wath SB, Dutt PS, Chakrabarti T. E-waste scenario in India, its management and implications. Environ Monit Assess 2011;172:249-62. MOEF. Guidelines for Environmentally Sound Management of E-WASTE. As approved by Ministry of Environment and Forestry (MoEF) letter No. 23-23/2007-HSMD; dated March 12, 2008. Johri R, editor. E-waste management, implications, regulations and management in India and current global best practices. New Delhi: Teri; 2008. Khetriwal DS, Kraeuchi P, Schwaninger M. A comparison of electronic waste recycling in Switzerland and in India. J Environ Impact Assess Rev 2005;25:492-504. Joseph K. Electronic Wastes Management in India. Proceedings 11 th International Waste Management and Landfill Symposium, Italy; 2007 Oct 1-5. Rani B, Singh U, Maheshwari R, Chauhan AK. Perils of electronic waste: Issues and management strategies. J Adv Sci Res 2012;3:17-21. Kalana JA. Electrical and electronic waste management practice by households in shah Alam, Selangor, Malaysia. Int J Environ Sci 2010;1:132-44. Ramachandra TV, Saira VK. Environmentally sound options for waste management. ENVIS J Human Settlements 2004;1:1-6. Ramesh S, Joseph K. Electronic waste generation and management in an Indian city. J Indian Assoc Environ Manage 2006;33:100-5. Radha G. A Study of the Performance of the Indian IT Sector; 2002. Available from: http://www.oldsite.nautilus.org/archives/cap/reports/IndiaExecSummary.pdf. [Last accessed on 2015 Jan].